Entrees are the dishes served between any of the regular courses. Croquettes are simply minced meat mixed with a thick sauce, then rolled into shape and fried. Any kind of cooked meat, fish, shell-fish, hard-boiled eggs, and some kinds of vegetables may be served as croquettes. Croquettes may be plain, using one kind of meat alone, or made richer by combining with it sweetbreads, brains, mushrooms, truffles, etc. Whatever meat mixture is used, the rules for sauce, molding, and frying are the same. The croquettes may be shaped like cylinders, pyramids or chops. The meat should be chopped very fine. (An "Enterprise Chopper" is recommended.) They should be very soft and creamy inside, and should be fried to a light golden color only. Serve them on a napkin and garnish with parsley. 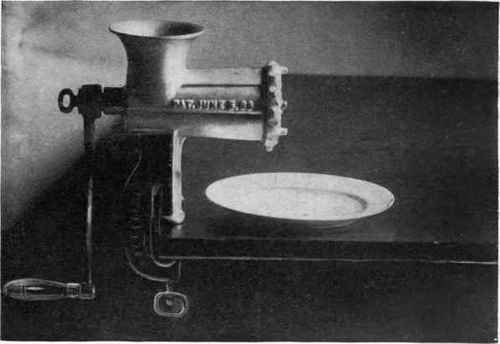 This simple machine minces meat very fine, and is useful in making croquettes, forcemeat for stuffings, etc. Where meat having much fiber is put in the chopper, it soon becomes clogged. The end piece can then be taken off, and the fiber clinging to it, which stops the holes, be removed. In making timbales the meat put through the chopper in this way, and then pounded, will sometimes do without being passed through a sieve. (To this amount of sauce add two cupfuls of meat). 2 tablespoonfuls of flour. 1 cupful of milk or cream. 1 egg. 1 teaspoonful of onion-juice. 1 teaspoonful of salt. ¼ teaspoonful of pepper. Dash of cayenne. Put the cream or milk in a double boiler and scald it. Rub the butter and flour together. Take this paste on a spoon and stir it in the scalding milk until it is dissolved from the spoon, and the sauce has become thickened and consistent. Add the seasoning; then remove from the fire and stir in a beaten egg (the egg may be omitted if desired). Place it again on the fire for a minute to cook the egg, but do not let it boil, and add two cupfuls of meat minced very fine. Pour this mixture on a flat dish, and set it away for two or more hours. It will then be stiffened and can be easily molded. If a mixture is used which absorbs the sauce, add more than the quantity given in receipt. The softer the mixture, the more creamy, and therefore the better will be the croquettes, and if allowed to stand long enough the molding will not be difficult. Take a tablespoonful of the mixture (this will make a croquette of the right size; large ones are likely to crack open in frying); roll it lightly between the hands into a ball. Have a plentiful supply of bread-crumbs spread evenly on a board; roll the ball lightly on the crumbs into the shape of a cylinder, and flatten each end by dropping it lightly on the board; put it in the egg (to each egg add one tablespoonful of water, and beat together), and with a spoon moisten the croquette completely with the egg) lift it out on a knife-blade, and again roll lightly in the crumbs. Have every part entirely covered, so there will be no opening through which the grease may be absorbed. Where a light yellow color is wanted, use fresh white crumbs grated from the loaf (or rubbed through a puree sieve) for the outside, and do not use the yolk of the egg. Coarse fresh crumbs are used for fish croquettes, which are usually made in the form of chops, or half heart shape. A small hole is pricked in the pointed end after frying, and a sprig of parsley inserted. For lobster croquettes a small claw is used instead of the parsley. Cracker-crumbs are used where a smooth surface is wanted. Have all the croquettes of perfectly uniform size and shape, and lay them aside on a dish, not touching one another, for an hour or more before frying. This will make the crust more firm. The white of an egg alone may be used for egging them, but not the yolk alone. Whip the egg with the water, just enough to break it, as air-bubbles in the egg will break in frying, and let the grease penetrate. Let the fat become smoking hot; then test it with a piece of bread. If the bread colors while you count forty (twenty seconds), it is right. It is well to put the frying-pot on the fire an hour before it is needed, so it will be hot, and ready to be raised quickly to the right degree. After dipping the frying-basket in the fat to grease it, lay in it four croquettes so that they do not touch one another, and immerse them in the fat. Cook only long enough to attain a delicate color. Let them drain a moment over the hot fat; then lift them from the basket with the hand (if done quickly the hand will not be burned) and place on a brown paper on the hot shelf or in the open oven until all are ready. Do not fry more than four at one time, as more would reduce the heat of the fat too much. Let the fat become smoking hot before each immersion of croquettes. Hang the basket on a long iron spoon so the hand will not be burned by the spattering fat.